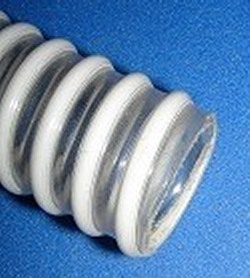 BTF, By The Foot, flexible pvc duct/hose, clear, smooth on the inside that is made to slip over 4" Sch 40/80 rigid pipe, or other pipe with an OD of 4.50". Pipe is clear for easy inspection with white helix for strength. ID of this pipe is 4.50, OD is approx. 5.25" Min. Bend radius: 9", Working pressure at 68F: 30PSI, Burst pressure: 80PSI, Vacuum Rating: 28"/Hg.